Labor Day Weekend… completed days 22, 23 and 24 of my 40 day goal of Bikram/Baptiste yoga! On day 24, I stopped at the grocery store on my walk home feeling great, but unfortunately had a horrible experience. The woman ahead of me in line to check-out lingered awhile after she paid. She was an uncomfortable foot away from me and I could feel her blatant stare. Figuring she was just taking her sweet time to pack up her bags and go, I was stunned when a derogatory comment about my head scarf, (and another woman’s she’d seen that day), came out of her mouth. I was at a loss for words, I could feel my blood start to boil as my cheeks turned even more red from just leaving hot yoga…so I simply said that I was sick and the other woman probably was as well, then turned back to face the cashier. I assumed I’d hear some kind of apology or words of remorse for her hurtful comment, but she just kept going. My genes from my mom’s fiery side arose, but I dug deep, took a deep breath and found my dad’s calmer side in me as I turned and politely told her to please stop talking. This time she was stunned and walked away. The poor cashier was a kid and looked equally as shocked as I was. He kept apologizing, but I kept assuring him that it was not his fault at all. We both couldn’t believe what had just happened. When life gives you lemons, make lemonade. When life gives you limes, make margaritas. 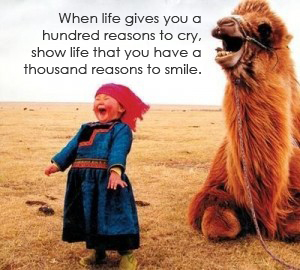 When life gives you a hundred reasons to cry, show life that you have a thousand reasons to smile. It’s 2013. Unfortunately, cancer is a common disease and hair loss is a very common side effect of treatment. One in fifty people have alopecia and there are other sicknesses that cause hair loss. Not always, but full head scarves, especially the style that I was wearing, (I purchased it from a chemo scarf website), typically signifies a disease. It saddens me that this woman was that insensitive to feel the need to verbalize her negative comment. I walked home and then got teary once I told my fiance what happened. He got me to laugh about it. We took a family walk and I felt much better. Words can be hurtful, but how you react to them determines how they will effect you. I had shared my story on Facebook for the first time a few days before and received really supportive messages. After our walk, I sat down to read them again and either I accidentally deleted the post, or maybe my son did while playing with my phone, but they were gone. I was surprised how sad I was about it or maybe it was just the earlier experience at the grocery store, but I realized it’s another lesson on impermanence. Clinging to words whether positive or negative is attachment and I was reminded again of the importance of letting go. 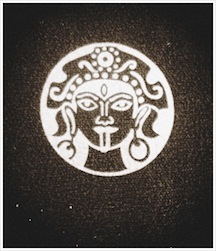 My mom gave me this yoga mat with an image of Kali Ma – the goddess of time and change that takes away the darkness from any devotee who strives in the path of perfection. Perfect is relative. I’ve always been drawn to wabi sabi, the Japanese design aesthetic that is centered upon beauty in imperfection. Nothing lasts, nothing is finished and nothing is perfect. Wabi sabi. Everything happens for a reason. I’m a firm believer in that you have to experience the negative in order to truly appreciate the positive; every experience shapes and will continue to reshape who you are. As difficult as alopecia is, I can honestly say that I am grateful for it. It’ll be awhile until it evens out, but my hair is slowly starting to grow back and I credit it to nutritional changes, daily meditation and yoga practice. Namaste Kali Ma. this reminds me of something i read in a parenting book i think – when your child comes home and says that so-and-so was mean or said bad things, remind them that that person must have been hurting. Hurt people say things that hurt other people. If someone says mean things, it’s only because they themselves feel bad about themselves or are hurting themselves. Pretty soon that child will feel empathy (hopefully) for that bad mean person or at least get tired or your explanations and shrug it off. En bref, that poor person in the grocery store must have a rough life if she is telling off women in head scarves. ANd PS: way to go on the yoga!!!!!!! 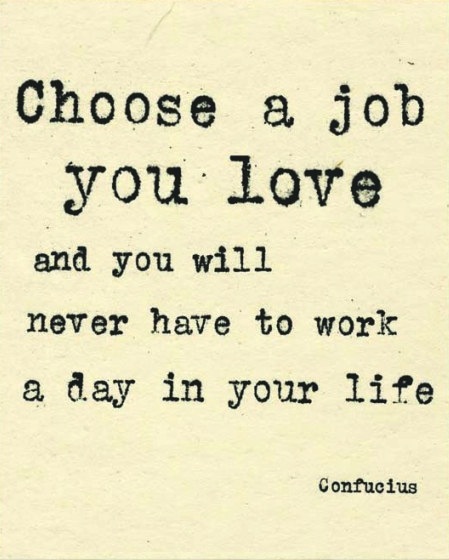 and with two youngins at home, to make that time for yourself is beyond amazing. double pat on your back for that!!!! agreed. it’s that basic elementary school lesson: if you don’t have something nice to say, then don’t say anything at all.